Chicken pasanda is a super-delicious chicken curry made with “warm” spices rather than fiery ones. But you do add fresh chilli as well. 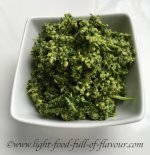 You are meant to use green chillies in this curry but as I don’t really like the green ones – just as I’m not very fond of green peppers (bell peppers) – I use red chillies. The choice is yours. 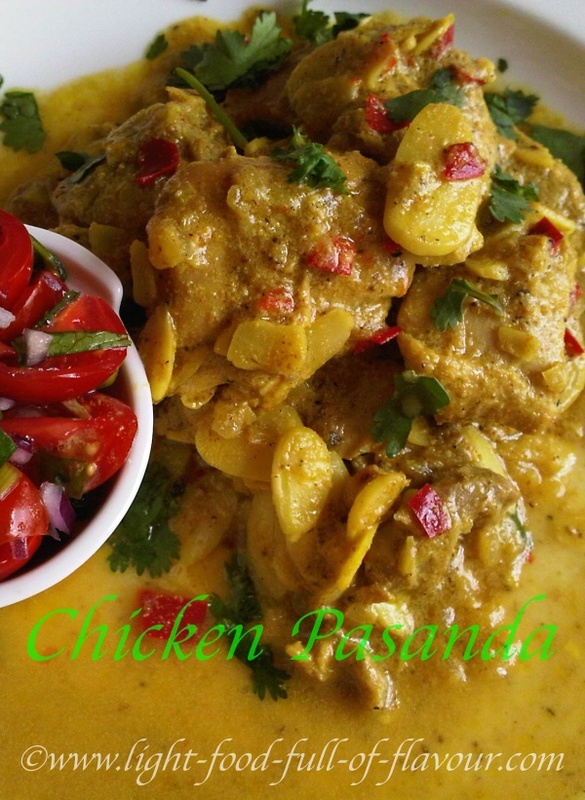 The sauce for the chicken pasanda is creamy but light and made with yogurt and stock to which you add flaked almonds. I have started to use whole spices that I grind myself more often. Ground spices deteriorate so much quicker than whole spices and you do get more flavour from grinding whole spices. And rather than using a ready-made spice mix – like curry powder or garam masala – I’ve started to make my own. This way you are in control of what goes into your dishes and can experiment more. 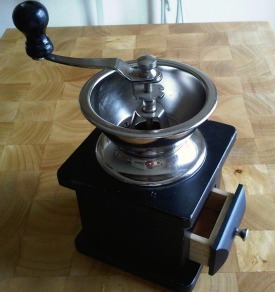 I used to grind my spices in a pestle and mortar but then I found a used coffee grinder in a charity shop (£2.50!). This excellent piece of equipment is great for grinding spices. You need to marinate the chicken for at least 1-2 hours. If you’ve got a bit of time, marinate the chicken for the curry in the morning. It doesn’t take that long to cook this curry once the chicken has been marinated. To make this a healthier and more of a low-calorie meal, eat this chicken pasanda curry with vegetables rather than with rice. I serve this with a gloriously fresh-tasting tomato salsa (see recipe below) and green beans. You can also serve it with oven-roasted butternut squash wedges. Brush the wedges with olive-oil and sprinkle with a bit of salt and dried chilli pepper flakes and place in the oven - 200C/400F/gas mark 6 - for around 35-40 minutes. 1. Start by dry-roasting the coriander and cumin seeds, cardamom pods, cloves, black pepper corns and piece of cinnamon stick in a frying pan over a medium high heat for 1-2 minutes until the spices start to become aromatic and a few shades darker. Once cooled down, split open the cardamom pods and place the seeds together with the other roasted spices in a pestle and mortar. Grind to a fine powder. Once this is done, mix in the ground ginger and turmeric. 2. Mix together the spices and yogurt in a bowl. Add the chicken pieces to the yogurt and toss until all the pieces are well coated. Cover the bowl and place it in the fridge for at least 1-2 hours. 3. Heat the oil in a large heavy-based pan (that has a lid) over a low heat and add the chopped onion. Cook for about 10 minutes – stirring frequently – until the onion is really soft but not browned. Add the ginger, garlic and chilli to the pan and continue to cook for a further couple of minutes. 4. Add the chicken pieces and all of the marinade to the pan. Turn up the heat and keep stirring until the chicken starts to colour. Add the stock, season with a bit of salt, stir and bring to a boil. Reduce the heat, cover the pan with a lid and simmer for 30 minutes. 5. While the chicken pasanda curry is simmering, make the salsa. Mix together all the ingredients in a bowl (glass or porcelain) and leave to stand. 6. Remove the lid from the pan, stir in the flaked almonds and continue to simmer – without the lid now - for another 5 minutes. Check the seasoning and sprinkle over some chopped coriander before serving.